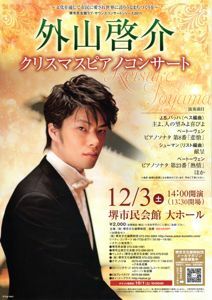 Yesterday afternoon, my wife and I went to Sakai Civic Hall to listen to "Keisuke Toyama Christmas Piano Concert." Toyama was born in Sapporo in 1984 and got the first rank for the piano section of the 73rd Japan Music Competition in 2004. Thus, he is one of pianists whose activity in the future is much expected. The program included Beethoven's Piano Sonatas No. 8 "Pathétique" and No. 23 "Appassionata." An encore was Franz Liszt's "Dream of Love" No. 3. One of the factors that make the joy of listening to music seems to be two kinds of repetition. One kind is the repetition of the listener's experience, i.e., repeated listening to the work we already know; and the other, the repetition in the structure of the work, i.e., repeated appearance of the melody that constitutes the theme of the single work. Did anyone already write a similar thing? If you knew that this was the case, you would just have enjoyed the repetition of reading the same thought.